This week’s question caught my attention because it’s similar to a problem that I’ve fought with in my own life. While I don’t know of any great solutions, there are a few tricks that might help. I’ve recently got in a little trouble. Now I need to come right home after school. I used to go to the library to study but now I can’t. The problem is that my house is always busy. I have 5 siblings. The house we live in isn’t all that big either. Every time I try to study I end up freaking out about the noise in the background. Is there any way to handle this? I sympathize with this problem. After getting used to a silent study environment for so long, I often find even small background noises can become huge distractions. I imagine this is even worse for sounds as unpredictable as a ton of siblings. I can imagine being driven nuts by that myself. It’s good that you figured out the library to solve your problem in the past. I don’t know the extent of your “trouble” but if politely asking to study at the library might work, that would be my first suggestion. I won’t waste any more time on that idea because I imagine you’ve already considered it. If you can’t study in a quiet environment (like the library) and you can’t turn your environment into a quiet one (perhaps asking people to shut up, kindly of course,) then I’d consider one of two solutions. First of all, experiment with the timing of your studying. This is the ideal solution. If you can wake up a couple hours earlier, or go to bed a couple hours later, than everyone else, then you can likely find a much quieter time to study. This will allow you to have your quiet time without sacrificing any study efficiency. If that isn’t possible then you’ll have to sacrifice some efficiency. While I don’t normally recommend studying with headphones in, there are some exceptions to the rule. Ultimately, these strategies will likely harm your efficiency in studying but they will harm it less than the distraction of other people around you. Try putting in some headphones and playing some white noise in the background. Turn the volume up to a level where it drowns out the people around you (assuming that volume isn’t too high.) The white noise can be anything from the faint hum of a radio without a station or things like the sounds of an ocean. As long as the sounds aren’t particularly interesting, they’re ideal for studying. If the volume required to drown out the background noise is at an uncomfortably high level then consider listening to music in the background. This is likely hurt study efficiency worse than white noise but could be better than white noise at distracting you from background noises. Be careful if you choose to implement these strategies and know that you’re likely studying in subpar conditions. As soon as you have an opportunity to avoid this problem in the first place, you should avoid it and take out the headphones. 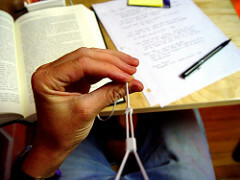 Headphones can make studying more enjoyable but more enjoyable generally means you’re less focused. Do you want to know how to study in less than 15 minutes a night? That’s what this blog is all about. Be sure to check out the archives and follow along for all the details. Also, check out the ebooks in the sidebar to learn even more faster. Can I just say what a relief to seek out somebody who truly knows what theyre speaking about on the internet. You undoubtedly know tips on how to bring a problem to gentle and make it important. More people have to learn this and perceive this aspect of the story. I cant believe youre not more common since you undoubtedly have the gift. Generally I don’t read post on blogs, but I would like to say that this write-up very forced me to take a look at and do it! Your writing style has been amazed me. Thanks, quite great post. I find listening to music makes studying much more tolerable and so I can do it for much longer, but I do reckon the quality of my revision falls. My favourite things to listen to are BBC Radio 1 (probably the most distracting since there’s actually conversation to follow), my relaxing playlist (classic music with no lyrics) or just general pop music. Even though most people say don’t listen to music it’s not done me much harm since I get good grades. Studying with headphones in can certainly distract from the studying but if its your only option remember to select the music or noise carefully. A useful tip, if you so want to listen to music is to put on classical music or instrumental music (without any lyrics). Then you can get the pleasant effect of listening to music (much more enjoyable than something like white noise) without the full distraction factor of music with lyrics which can pull your focus. I’ve been doing this for 2 years now. Listening to relaxing melodies really helps. I recommend not using songs with voices for your study sessions, because sometimes, especially when you know the lyrics, you tend to lose your focus, and go with the beat. @Elfprincess That would be a great thing to do! The sounds you mentioned are both relaxing especially in a place where incessant noise is present. Sometimes what works for me us listening to one particulat song over and over! I do the same thing. Waking up early to finish my work. Sometimes, i listen to the same song over and over that help me focus. This is so smart – I never thought about listening to white noise via headphones! I’ve always listened to music, which while it makes the experience pleasurable, can be pretty distracting (as you noticed). The next time I’m gonna try to study while listening to ocean or rain sounds.